On November 18, 2016, in light of the recent election, Amrita Chakrabarti Myers, associate professor of history at Indiana University-Bloomington offered this reminder on Facebook of what standing up against injustice has meant, across time and place. I’ve often heard people say that if they’d been alive during slavery, they would have been abolitionists. That if they’d been around during the rise of fascism in Germany, they would have stood up for Jewish people. That if they’d lived in South Africa under Apartheid, they would have been on the side of Nelson Mandela and his followers. And, that if they’d been in America during the 50s and 60s, they would have worked to end segregation. Well, we are now living in a time and place where each of us will have to stand up and be counted. Will we ally ourselves with those in power? Will we stand on the side of the besieged and disenfranchised? Or, will we do and say nothing out of fear, complacency, or short-sightedness? Every scenario mentioned above was legal at one point, and standing against those systems was dangerous. So, I ask you to search your hearts and decide… where will you stand, remembering that, “what is right is not always legal, and what is legal is not always right.” Selah. An impassioned condemnation of the Fugitive Slave Act passed by Congress in September 1850, which increased federal and free-state responsibility for the recovery of fugitive slaves. The law provided for the appointment of federal commissioners empowered to issue warrants for the arrest of alleged fugitive slaves and to enlist the aid of posses and even civilian bystanders in their apprehension. 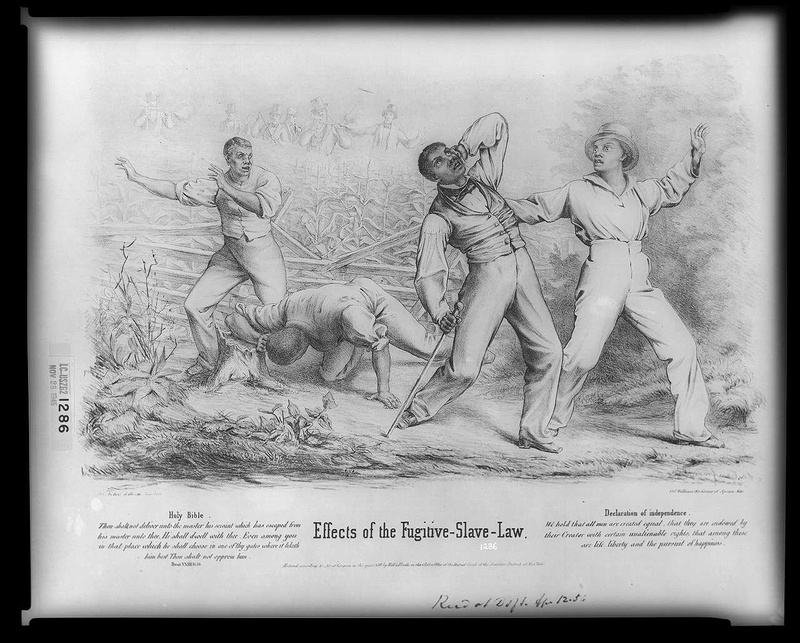 The print shows a group of four black men–possibly freedmen–ambushed by a posse of six armed whites in a cornfield. One of the white men fires on them, while two of his companions reload their muskets. Two of the blacks have evidently been hit; one has fallen to the ground while the second staggers, clutching the back of his bleeding head. The two others react with horror. Below the picture are two texts, one from Deuteronomy: “Thou shalt not deliver unto the master his servant which has escaped from his master unto thee. He shall dwell with thee. Even among you in that place which he shall choose in one of thy gates where it liketh him best. Thou shalt not oppress him.” The second text is from the Declaration of Independence: “We hold that all men are created equal, that they are endowed by their Creator with certain unalienable rights, that among these are life, liberty and the pursuit of happiness.” The print is unusually well drawn and composed for a political print of the period. The handling of both the lithographic technique and the figures betray particular skill.